This past Monday, October 12, I was honored to not only attend the 14th Annual Celebration of Reading hosted by the Barbara Bush Foundation for Family Literacy, but to also have Little Lamb Books sponsor eight (8) teachers for the event. Attending the event at the Meyerson Symphony Center in Dallas with my husband (Woohoo for a working date night! ), we mingled with other fans of literature and reading. As we sought out our seats, we were handed the new children’s picture book titled Where is Pidge? authored by Michelle Staubach Grimes, the event’s chairperson. Once settled in the auditorium, we were treated to a surprising and humorous Facetime visit between Mrs. Bush and her daughter, Doro Bush Koch, from the stage as well as a sweet image of President George H.W. Bush saying hello and waving from his home. We were also privileged to hear from five (5) amazing authors, all New York Times best-sellers for their published works, who read from their newest books. 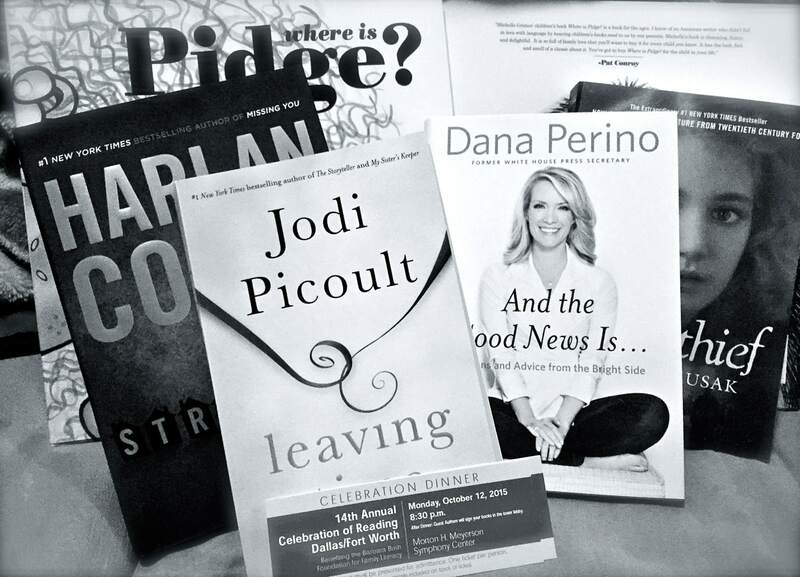 Jodi Picoult, Harlen Coben, Markus Zusak, Scott Simon, and Dana Perino each visited with the audience from the stage, and then stayed after the dinner to sign copies of their books, which were gifted to attendees. Each author offered the audience an emotional connection-Jodi Picoult was endearing, Harlen Coben was humorous, Markus Zusak was familial, Scott Simon was thought-provoking, and Dana Perino was respectful and patriotic. All of them were tremendously kind and giving, and left a great impression on me about the impact of literature, novels, and reading. And, honestly, what a sweet moment to be able to hand my mom, who is a big fan, a recent cancer survivor, and our built-in babysitter, a personalized and signed copy of Dana Perino’s book, And the Good News Is…, when we arrived home! The evening was both entertaining and inspiring, but most importantly, it reinforced the vision of our company that providing books that are clean, fresh and creative is both important and necessary. Our children need to learn to read because it opens up so many opportunities for them. Our children need to have books to read that are going to encourage them, enrich their daily lives, and inspire their faith because they are facing a variety of challenges in a world that is very different from anything seen and lived in by previous generations. I’m so glad that we were able to participate in this special night, and I’m even more grateful to know that we have partners in the business of helping and reaching kids.